I try to join Ned Harris and his naturalists tours in Sabino Canyon at least once a month. It's nice to be in like-minded company, even though I usually don't last very long in the group because I stop too often and too long for insects that are too small for most participants' eyes or camera lenses. This time, my first stop (before I met the group) was devoted to the resident Roadrunner. When I found the nest, very well hidden in a Chain Fruit Cholla, I got a glimpse of some chicks and some as yet unhatched eggs. Roadrunners begin incubating right after the first egg is laid so the chicks are as different in size as organ pipes. Many birds with nestlings that are born blind, featherless and dependent on their parents (altricial) follow this strategy. For the youngest ones, this can be perilous. Their only chance of survival is a year with plenty of food. Under poor conditions the parents can decide to raise only the older, stronger siblings to ensure at least their survival. There seems to be a tuft of fur from a bunny or a rock squirrel tail in the nest. So this pair is bringing in rather big prey. That probably means good chances for all the chicks. When I checked again on my way back, I was greeted by the angry stare of one of the parents. Altricial chicks are rarely left alone, and that means that in many species both parents share the nest duties. Two lonely, very young Mallard chicks were dabbling in the small pond by the dam. They were contently feeding on the willow seeds that drifted into the water. Very different from roadrunners, ducks are precocious birds. The female only starts incubating after she has laid the whole clutch. So the chicks all hatch on approximately the same day even though some eggs are up to 2 weeks older than others. The chicks hatch with feathers, open eyes and ready to go. And they have to. The family, which means mother and chicks, the father is not involved, leaves the nest and the dangers of sedentary living and moves out right away. The two in the picture seemed actually to be on their own, no mother in sight. And yet, they still have a chance to grow up. The first interesting insect was a little fruit fly that I had never seen before in the Tucson area. Some of these flies can become invasive destructive pests of agriculture. That's what those controls between CA and AZ are about, to stop the cross border transport of infected fruit. So I sent this photo to a friend who works at USAD. Just in case. We all thought that it looks quite similar to the Apple Maggot Fly, Rhagoletis pomonella (which would not find a lot of suitable food in Sabino, I'd say, not many rosacean plants there). Unlike the apple Maggot Fly, it has no white scutellum. Martin Hauser then pointed out that it could be Procecidochares atra, in which case it would be a gall producer rather than a fruit maggot fly. As the common host, Golden Rod, doesn't grow at the elevation, I will be looking for similar galls on related plant species. In the canyon, Brittle Bush was still blooming where it thrives on water run-off from the road. The dominant bees here were Dufourea sp. 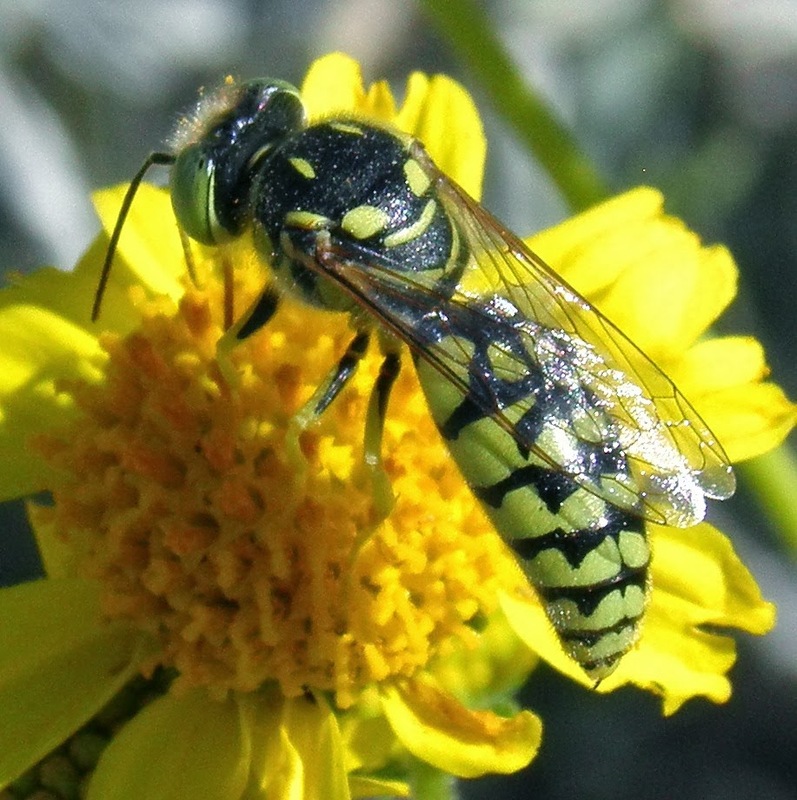 in the Sweat Bee family Halictidae. The bees were joined by a great number of Checkered Beetles, Clerids, who were feeding on pollen and trying to find mates. Both striking color morphs were present, the bright yellow-black and the red-black version. The two forms mate freely and either color-type occurs in both sexes. I have no idea how the genetics work in this case. A greenish black Tooth-nosed Snout Weevil occurs every spring on the brittle bush flowers in Sabino, but I have yet to find it anywhere else. The Metallic Wood-boring Beetle Acmaeodera sphaeralceae is also a springtime regular of Sabino Canyon, but before I've found it more often on Globe mallows. A leaf beetle on Brittle Bush leaves turned out to be a new species for my photo collection. The species is one of a few in this difficult western genus with 16 to 18 species that can be identified from a photo. This other leaf beetle is so common on Brittle Bush that I find it every year, but its wing coloration is very variable, so the identifications on BugGuide have triggered a lot of discussion. Some years ago, I collected some in the larval stage and watched them for a while after the metamorphosis to the adult beetle: The wing pigmentation kept changing for weeks, way beyond the usual teneral stage. T. geminata seems to be the most likely species id. Some New Mexico Thistles were covered in Honey Bees, others hosted loads of Blister Beetles in the genus Nemognatha. I don't think the beetles would cause a problem for Honey Bees, but the solitary Diasdasia bee above was certainly in danger of picking up a beetle larvae that would then live as a cleptoparasite in her nest and feed on the provisions that she had accumulated for her own brood. On this beautiful spring day, larvae and nymphs were everywhere. One of my favorites is the young Mexican Bush Katydid. The adult Katydids are just green and have long wings. I also found the first hatched clutches of Giant Mesquite Bugs, Thasus neocalifornicus, whose mother had left the eggs in a sheltered spot under the bark of a mesquite tree before the winter. These little guys will molt one more time and then, always as tight-nit a group of siblings, try to reach the freshly thriving mesquite leaves. I followed the life-cycle of Thasus in an earlier blog. Leafbeetles on the Datura plants in the shadow of the willows by the creek were starting the next generation. Just when the wind was kicking up in unpleasant gusts I found a couple of specimens of a rarely photographed Mason Bee. I wished my photos had come out better, but by then everything was too windswept. Ornate Tree Lizards were trying to warm up on light colored rocks to get ready to pounce on all those bugs. It was after noon when I was finally back on the tram road approaching the entrance, and I remembered the turn circle for school buses where we usually found Ironcross Blister Beetles at this time of the year. Maybe it's still too early, although the little blue star flowers that attract them were blooming. Walking along with my eyes on the ground I saw something hop that seemed to slender to be a grasshopper nymph. I found that it had to be a fulgorid planthopper, but one that I had never seen before. Lois O'Brien confirmed it: It's Rhabdocephala brunnea, a species that is not common, even Lois has only 3 specimens in her collection. So as always, Sabino Canyon was worth the long drive across town. Our house is built on sand. It sits on a little mesa (elevation) consisting of soil that was excavated to put in the basement. Over the years I found out that we share this site with many sand loving, digging insects, tarantulas and scorpions. And please don't think that that is a problem. Some of these guys may even keep out others that we would like less. Yesterday I was reading at the bedroom window when I noticed a dark little bee zigzagging and descending repeatedly out of sight under the window. Time to investigate. When I got outside, she was resting on a flat rock. In the soil around it were several small, round holes about 5 mm in diameter. Another bee buzzed closer, circled, landed next to one of the holes and slipped inside. This bee was larger, plumper, and lighter than the little observer. It stayed in the hole for a long time. While I was watching, two more bees arrived and crawled in. for over 10 min no bees left as far as I could see. Then the smaller bee flew up, circled shortly and also crawled into the hole. Several other bees of the bigger kind entered 5 other holes, all in an area of less than a square meter. Eventually bees also exited the hole that I was watching, but too fast to get any good pictures. Peak activity seemed to be around 10 to 11 am. Today I came better prepared. For example, I found a way to sit instead of crouching over the hole for what turned out to be long waiting times. So I got some video of the larger bees that clearly shows that several bees are using the same entrance and are under ground simultaneously. Incidentally, the little bee was inside during that time as well. This time I trapped her and three exiting larger bees to get a closer look. I had an idea by now that I was dealing with mining bees and a clepto-parasite, but I found that I didn't have these guys in my photo collection yet. Ancylandrena sp. Doug Yanega det. Indoors, I put each bee into a white ceramic bowl and covered it with a clear plastic container. It took a while for them to calm down. If they had been beetles, they would have experienced a short cool-down in the fridge by now, but bees just don't look right when they are cold. So instead, I got the chance to take a few quick photos, some OK, some blurred and some out of focus, of each bee before she took off for the window. No harm done, they were easily coaxed back into the container. Hexepeolus rhodogyne, Doug Yanega det. In the close-ups, the parasitic bee looked somewhat beat-up. Maybe her life as an uninvited guest was not quite as easy as it seems. But her visits in the nest, concurrent with those of several 'owners' did not seem to create any disturbance. Several of my Flickr and facebook connections are bee specialists, so I posted the photos there and on BugGuide. From Doug Yanega came the response: "The latter is Hexepeolus rhodogyne, and it is a cleptoparasite in nests of Ancylandrena (the first bee). It wasn't until the 1990's that the host-parasite association of these taxa was confirmed, as I recall. The genus Hexepeolus contains only that one species". Anyway, I preserved a specimen. So to summarize, Ancylandrena is a mining bee. In spring males and females emerge from underground cells. They mate, and the females dig nest burrows in sandy soil. Mining bees collect pollen in the long hairs of the tibial scopa of the hind legs. (They do not have a 'pollen basket' like honey bees and bumble bees). They construct small cells containing a ball of pollen mixed with nectar, upon which an egg is laid, before each cell is sealed. Although not social, several individuals seem to be sharing at least a nest entrance (Solitary, communal ground-nesting). As many insects do, they provide provisions for their offspring, but they are not around to guard the larvae while these are growing up. Clepto-parasites like the one I observed commonly make use of this arrangement to raise their own brood. Many of these clepto-parasites, like this one, are in the subfamily Nomadinae (Cuckoo Bees). They usually lack the hairs that are used by their relatives to collect and transport pollen. There are a number of strategies to get parasitic eggs into a provisioned nest. In this case the cleptoparasitic bee just followed the host bees to get her eggs into the brood chambers before they were closed. In Rozen's study several eggs of Hexepeolus rhodogyne were attached to the inner wall of the brood chambers while the larger egg of the host bee was sitting on the pollen ball. This explains why Hexepeolus was around for several days entering the same nest repeatedly: she had to access the chambers that were just in the right stage of construction. PS: I was busy at an art show for three days, but when I checked again on Monday, 3/24/2014 there were still Ancylandrenas entering the same nest. I also found another nest about 60 meters south on a berm planted with cacti and creosote bushes. Update: In the following years I did not see these bees nesting again. But my observation and photos made it into a great new bee book 'The Bees in Your Backyard' by J S Wilson and O M Carril Princeton University Press 2016. In April 2018, on our neighbors' potted Aloe, I found a group of sleeping males of another Ancylandrena species Ancylandrena rozeni. This species was first found described in the Tucson Mountains. Mine were identified from my photos by John Ascher. In April 2007 J. Dockens posted her observation of a small Apiomerus from the Boyce Thompson Arboretum in Superior, Arizona, on BugGuide, and Eric Eaton identified it as Apiomeris cazieri. So how did this discrepancy come up and who was right at the time? The specimens had been part of the type series of Leopold Szerlip's description of a new species for his doctoral dissertation. A Berkeley grad student at the time, Szerlip completed a biosystematic analysis of the Apiomerus of North and Central America in 1980 as the topic of his doctoral dissertation. Unfortunately other than qualifying him for his PhD, nothing more was done with the information; a paper was never published. As a result, the 19 new species erected within it were invalid. But at the same time, no other scientist felt comfortable to do any work on the group because of this existing manuscript. At BugGuide and at the U of A specimens kept coming up that were carefully designated as Apiomerus crassipes species group (crassipes species group) with 'A. cazieri' added in quotation marks. We all knew that 'A. cazieri' was a 'good' species, easily recognizable by its small size and the early spring appearance of the adults, but we also knew that the name was invalid. Then, finally in 2011 Ted C. MacRae posted: Resolution! Anyone who is wondering how the validity of a species name is controlled and tested should turn to the code of the International Commission on Zoological Nomenclature (ICZN) and consult this scheme; names from Szerlip's unpublished thesis would have been disqualified in the second line. But what really surprised me most in this case was that this little Apiomerus that is so distinctly different from others in the crassipes group had been overlooked for so long and was not described before 1980. Of course, I have the advantage of living right in the middle of its habitat, so I see some of them every year when the Brittle Bush blooms in Saguaro National Park West. The reason for the late discovery may have been that early spring is not one of the most interesting times for all those collectors who usually arrive for the monsoon bugs. So keep your eyes open, Arizona still has more to offer! I feel so lucky that I was able to make my two passions into working carriers. I studied biology and pursued that education through masters and Ph.D. Research and teaching positions took me to many different countries in Europe, New Zealand and the US. Right now Mexico and Central America are my great love. Parallel to being a biologist, I built my business as a watercolor painter. I could not imagine to live without this outlet for my creativity, and nowadays the income from my art allows me the freedom to follow my own interests in the scientific field. So I was able to shift from the rigors of research in physiology and teaching medical school to the pleasure of doing mostly field work in entomology. Arizona proved to be the ideal place to sell my kind of art and happens to be in the heart of one of the riches areas of biodiversity on the globe. Luckily, my husband who grew up in California shares my love for the desert and was happy to move here. We bought enough land to have our own little nature preserve, allowing us a very intimate association with the Sonoran Desert and a house with ample studio space (at least we thought so at the time). Today my continued interest in insect macro photography is at the basis of most of my studies and even some of my art, and I am hoping that one day the result will be an illustrated field guide to Arizona's beetles and bugs. I was surprised how much I enjoy selling my work at open-air shows. I love the contact with people who are drawn to my paintings. I actually managed to change from a shy introvert into a rather out-going person. Nothing is a good for your ego as a constant stream of happy art show visitors! And of course it doesn't hurt when their appreciation results in sales. We are a materialistic society, and when people spend their hard earned money on my work it is a validation of my art that I appreciate far beyond the monetary income. I know. I could also try to compete in national shows for ribbons and prizes awarded by educated jurors. But I like the popular vote for now. The art shows take me to very pleasant parts of southern and central Arizona and even though they can be physically exhausting, there are worse ways to spend a weekend. Another reason that my two careers work out well together is that the show season in southern and central Arizona lasts from October to April. Insect activity slows down even in Arizona during this period, except for a few winter active sand dune specialists in the Yuma area. I usually find some time to spend with them, too. Shows are just weekend affairs. While my small business can be very time consuming, it allows me to freely manage most of it. 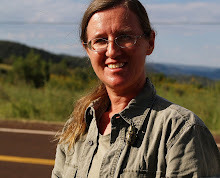 A few select summer shows provide me with a good reason to get out of the heat and into the higher elevation breeding grounds of some very interesting insect species on the Colorado Plateau, so that works just fine, too. I have also found that is great to combine these shows with presentations and field tours for naturalists. So nature festivals have become another fun venue. A big factor in all out-door shows is the weather. I began participating in tent shows in the mid nineties. Back then the winter rains were a reliable problem that forced me to upgrade my tent to industrial strength and weather-proof every aspect of my set up. We tried space heaters, spot lights, clear front walls to be closed when the rain blew in ... Even big shows in Tempe were apt to close down when Sky Harbor airport reported snowfall. But over the last years, the climate has changed markedly. Excessive heat can be a problem even in February. Winter rains have become so rare that they usually don't hit the shows. If they do, everyone is so happy to get rain that we aren't even sorry to see fewer customers. Professionally organized shows with seasoned participants hardly ever close down anymore. But one problem is becoming more prevalent: strong winds. 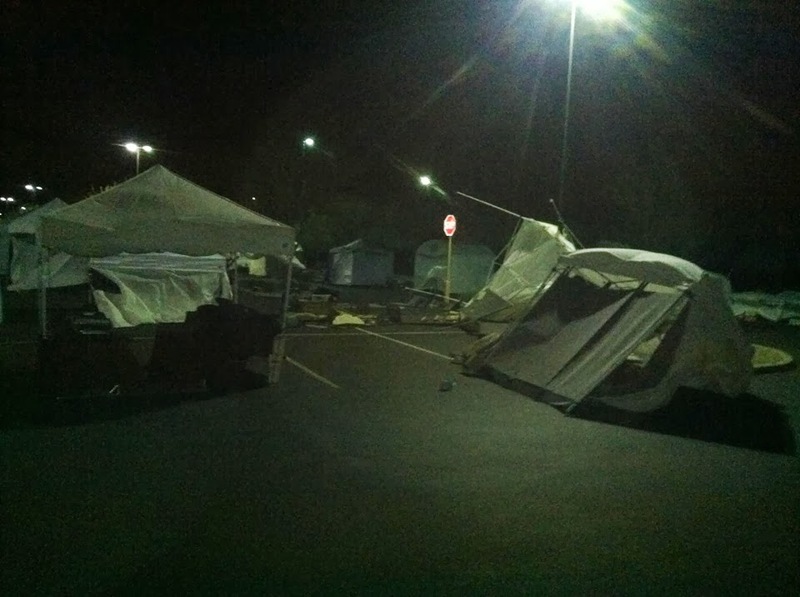 Arizona does not get hurricanes or tornadoes (although there are reports of touch downs of funnel clouds ever now and then) but there are some shows that are gaining a reputation for too much dust, blown-over tents, and lost inventory. Although my tent is stronger and heavier than most, I tend to avoid those locations. But sometimes strong sales reports can make even those shows tempting. I don't gamble. I get my thrills testing my luck at those shows. So I booked the SAACA art festivl in March 2014. On Saturday I enjoyed the busy location and the gorgeous view of Push Ridge in the Catalina Mountains. A couple of tents of blew over in wind gusts, but they were unsecured and lightly built. 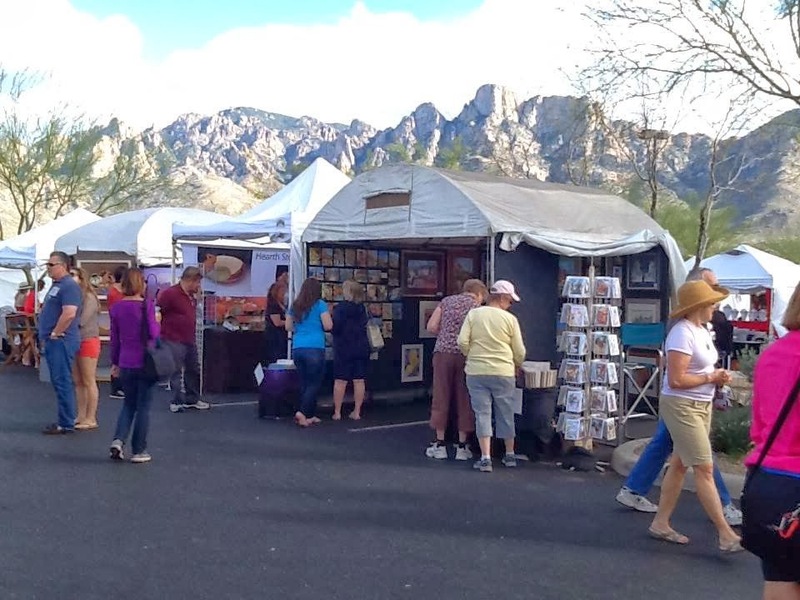 "Very localized but strong east winds of about 45 to 50 MPH caused damage to numerous tents setup for the Oro Valley Spring Festival of the Arts at the Oro Valley Marketplace late Saturday night into early Sunday morning. Expect gusty east ...winds to continue today, especially this morning. What is very interesting about this event is that some areas usually sheltered from strong east winds by the Catalina Mountains such as Oro Valley did see the strong winds this time. The meteorological mechanism for the east winds was different than usual as low pressure moved from north to south helping to enhance the easterly winds." Randy and I drove out to Oro Valley at 2:30 am because the wind was howling terribly at our house (about 40 mi west of the show). When we got there, more than half the tents were down, some in the road... my own tent, a 'Trimline' was just fine when we arrived, but while we were still wondering what to do, a gust picked up another tent three spaces away, a very heavy 'Crafthut' including wall panels with glassed paintings and weights attached and rolled the whole package on top of my neighbor's tent and mine. Framed paintings went flying and hit my van (I ducked behind it) and my front tent wall was sliced open. We got the upside down booth off my tent which stood still upright. In a break between gusts we were able to pack all my artwork ranging from big framed paintings to greeting cards as carefully as always. To gain time to do this, I let the tent roof fly lose rather than letting the wind rip it off. With this decrease in wind resistance we could break down and load the tent also without further damage. So I'm fine, my inventory is too, my van has some new battle scars, one tent wall needs fixing or replacing. I am just glad that it happened at a show close to home so Randy could help. Now it's 2 weeks until the next show at 4th Avenue in Tucson. It's March, and the 'garden' part of our property is erupting in color. We plant a few exotics like aloes close to the house. They are succulent low water-users from Africa, so they do well here in Arizona. Hummingbirds, Gila Woodpeckers and Verdins love them, but as most imported flowers, they are rather useless for our endemic insects. In our backyard the exotics are mixed with locals like Penstemon, Brittle Bush and Creosote Bushes that are all in full bloom too. Each species is visited by a distinctly different group of endemic bees and flies. On the yellow Brittle Bush discs, several species in the mining bee genus Andrena are extremely active. They were nearly completely missing last year after a severe freeze in late February. I am not saying that the bees had not survived, but their usual synchronization with the Brittle Bush bloom was totally off. Instead, last year we saw an abundance of Sand Wasps, that are usually much rarer. After this very warm winter the Andernas are back in their usual high numbers. Especially the males contribute to the buzz around the bushes. They try to mate with everything of the right size. Pairs in copula are nearly impossible to photograph because most mating attempts end in an undignified tumble off the flower. Mating flies are much easier to capture, even though the next example is a tiny fruit fly. There are several species in this group, like the Sunflower Seed Maggot Fly, that lay their eggs into the developing seeds of composite flowers. Several species in the syrphid genus Copestylum were feeding on Brittle Bush nectar, among them the huge Mexican Cactus Fly that is a convincing Carpenter Bee mimic. Palpada furcata, Copestylum mexicanum (Mexican Cactus Fly), Eristalis sp. Most Copestylum species in Arizona lay their eggs in dead or injured cacti so their huge maggots can develop in the unlimited resources of for example a decaying saguaro. The pair in the photo was actually flying around together and probably wasn't planning to use the perfectly healthy little Christmas Cholla as a larval host. Here is another syrphid fly. While the adults of Eupeodes volucris also like nectar, they are also drawn by aphid populations on the flower stems. Aphids are the main food of the larvae. Any place where many insects that collect and store food for their offspring regularly appear, like here Mining and Honey Bees, attracts also brood predators that want their kids to go along for the ride. These may lay eggs on the flowers or on captured males or females of the target species, or the parasite follows them home to then throws her own eggs into the open nest entrance. They are often related bees like the Nomada species above (Cleptoparasites of Andrena and others). Blister beetles also lay their eggs on the underside of flowers hoping that their hatchling larvae will find their way into a bee's nest by hitching a ride on a flower-visiting adult. Lytta auriculata showed up for the first time on our Brittle Bush. Bee fly females can often be seen hovering over the entrance of a ground bee nest, tossing their eggs into it in a characteristic forward thrust. Of course the flower visitors are also assaulted by a number of direct predators that are waiting close to the nectar sources. I would have completely overlooked the flower crab spider in its camouflage if I hadn't seen the contrasting spec of its prey. Ambush bugs may be much better hidden on flowers by color and shape than this assassin bug Zelus renardii, but her leafgreen color and stealthy approach give her a wider hunting range. So I am looking forward to our Brittle Bush bloom every spring, and I don't mind at all that we find more young plants every year. They only grow on the artificial patio elevation anyway, I suspect that the caliche layer under the undisturbed soil does not agree with them. They pretty much dry up during between April and mid July and come alive again during the monsoon. By the time the Brittle Bush flowers are drying up and the gold finches are beginning to investigate them for seeds, the first cacti are blooming, usually Beavertail Prickly Pear and Arizona Hedgehog. Even after the flowers are all wilted, Brittle Bush still offers something to the local bee population: Megachile Leafcutter Bees are cutting the tapestry for their nest chambers from the leafs.